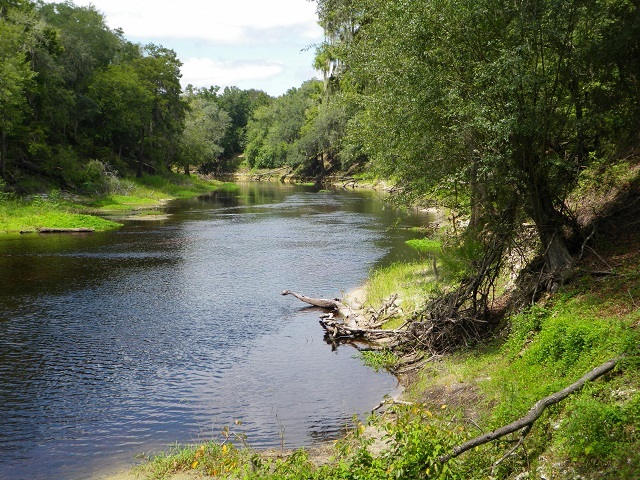 Hike the Florida National Scenic Trail (FNST) as it follows the Suwannee River through the Holton Creek Wildlife Management Area’s gorgeous old-growth bottomland and floodplain forest. You will be rewarded with nice vantages from the occasional river bluffs; additional habitats include sandhills, upland mixed forest and floodplain swamp. Songbirds like Acadian Flycatcher, Northern Parula, Yellow-throated Warbler, Hooded Warbler and Blue Grosbeak breed here, and Blue-headed Vireo and Hermit Thrush are present in winter. The unpaved entrance road is generally passable for two-wheel-drive vehicles; three separate parking areas along the entrance road provide access to the FNST and additional hiking trails. Seasonal hunting takes place and the area is closed 6 weekends per year (except for registered Florida Trail hikers); please click here for more information. Paddlers on the Suwannee River Wilderness Trail may stay overnight at the Holton Creek River Camp (call 1-800-868-9914 for details and reservations).